- When you first arrive in the area around Diamond City, primarily to the east, you’ll pick up a radio signal labelled Trinity Tower Radio. This is a repeating message from a dude named Rex, and if his signal is any indication, he’s soon to be eaten by a bunch of Super Mutants. He needs you to help him out. - You’ll find Trinity Tower, the place where he’s being held, to the east of Diamond City. It’s on the south side of Trinity Plaza. Not too difficult to find once you’ve located Diamond City. Be careful of Raiders, Gunners, and Scavengers fighting with each other along the way. - As soon as you get within sight of Trinity Tower - which is easy to spot, since it has an enormous ‘Trinity’ sign on the front of it - you’ll see a Super Mutant and a Mutant Hound on the second floor. Another Super Mutant is patrolling the stairs leading up into the Tower. It’s a tough combo, but you can hurl explosives inside to get the drop on all three, and use the cars outside for cover. - Head up the stairs. On the next floor there’s an elevator, which seems like a bad idea… and is. Unfortunately, there’s no other way to reach the upper floors. Check this floor and the next for ammo in the disgusting meat bags littering the place, then hop in the elevator. There’s likely going to be a Super Mutant at the top; don’t charge out of the elevator until you know where he is. Two more will show up in short order when the shooting starts. Stay in this first room and shoot them down at a distance, if you can. One, possibly two of them will try to melee you; take out their legs first. Though molotovs are a threat here, consider using your own explosives to take advantage of the smaller room. - The path branches out from here, though most of the rooms are connected. The doorway on the left will take you to a few medical items, and provides the best place to get the jump on another Super Mutant that’s likely still skulking around, so go that route. Up the stairs you see and on your left is the Super Mutant mentioned; if you have good aim you can hurl grenades through the windows and into his small room to make short work of him. Watch out for another Mutant Hound in these hallways. - To the right of the top of the stairs you’ll find the balcony overlooking the elevator, and to the right of that a ramp. There’s another Super Mutant at the top. Lure him down and wipe him out. The next room on your left has another Super Mutant, and, still going the grenade route, you can hurl explosives right through the window to easily kill him. You can also just shoot him in the head with V.A.T.S., as there’s a perfect shot. He’s standing near another elevator you need to ride. - You’ll come out in another tiered area, and if you watch the balcony straight ahead you’ll probably see a patrolling Super Mutant after a few seconds. Take him out however you like, but keep in mind that lots of noise will probably bring at least one other Super Mutant down on your head. There are medical supplies ‘round the desk to your right, and if you go through a door to the left of the desk you can find a path to an Advanced locked door. There are goodies inside. - This entry area is fodder for molotov-slinging Super Mutants on the upper floors, so take a left and go up the stairs. From here you need to fight your way to the higher levels through a combination of stealth and using rooms to your advantage. 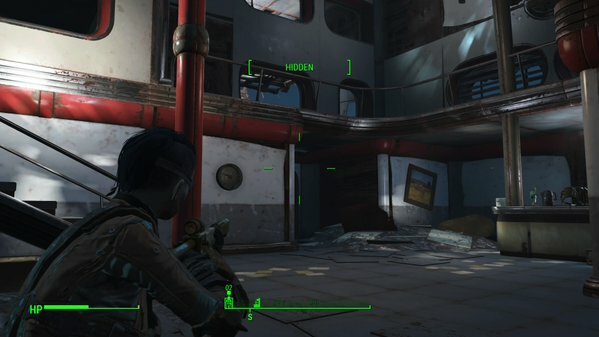 There are enough narrow hallways up here that you should be able to fight the Super Mutants one-on-one as long as you don’t run around too much between battles. You can also sometimes trick them into killing themselves with molotovs, and your own explosives work just as well. - Follow the ‘On the Air’ signs to find a path to the top of the building. At the very top, along with a normal dude you can easily handle, is a Super Mutant with a minigun named Fist. Fist is dangerous enough that you do not want to get into a face-to-face confrontation - but he’s also dumb enough that he’ll always return to this same room. Get rid of his comrade, hide, wait for Fist to go back to his spot, then either chuck grenades or lay down mines. In either case you can easily wipe him out without needing to face the minigun. If you do decide to fight, stay away from the large, open area that spans multiple floors, as he can gun you down from the top floor. - Rex, the captor, is being held in a cage beside Fist. There’s also another Super Mutant, Strong, who is… benevolent enough, I guess. You can let them out by grabbing the Trinity Tower Cell Key from a steamer trunk just outside the top enclosure. Check their small cell for a Melee Bobblehead, as well as a... Macbeth Script. Kay. - Once you let the pair out, run through the enclosure to the opposite side of the cell. There’s a lift here that will take you down Trinity Tower (and some med supplies in a kit). Once you’re descending, though, Super Mutants will repopulate the Tower and try to shoot at you. You shouldn’t bother shooting back until you’re forced to move from one lift to another, as most of the Super Mutants are well out of your reach. Strong and Rex can hold their own. - Once you reach the bottom, speak to Rex. He’ll complete the quest for you - and Strong will become available as a potential companion. Woo!